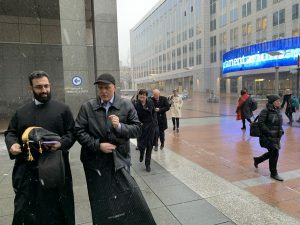 On Wednesday the 30th January 2019, a conference in the EU Parliament building was held to discuss the subject of ‘Free Speech in the Age of Censorship’. The event was hosted by Independent MEP Janice Atkinson, the ENF and sponsored / promoted by AltNewsMedia. A mix of influential voices from across the globe converged to share stories and insight into how the threat to freedom of speech has been growing, and to explain why this should alarm us all. As a platform for free speech, AltNewsMedia has always believed in civil debate and discussion, with all opinions having the right to be heard. We created a platform for that purpose, because it is never a good outcome to suppress voices that you might disagree with. It is always preferable to challenge them with better ideas and win the argument that way. As long as laws are not broken and violence is not incited, when one group of people takes measures to close down one side of a debate, it leads to fascism, dictatorships and oppression. For these reasons all fair minded people, whatever their political viewpoint might be, should resist the creeping censorship we see today in the Western world, something almost unbelievable just a few years ago. The conference highlighted the many ways people are censored, merely for expressing views and opinion that may not be the preferred narrative of the mainstream group think. It ranges from de-platforming from social media, having democratic political meetings closed down, income targeted, through to threats against individuals plus their family and friends. What became apparent with the group was how intelligent, good humoured and thoroughly decent human beings each and every one was, and during dinner the consistent message was one of just wanting the world to be a better place for everyone. Many have been demonised by the Fake News Media, because if you paint someone as a monster, you aim to take away their voice, as nobody listens to a monster, right? These people are anything but. Videos of the speeches will be published, and we recommend taking the time to listen them. The speakers on the day were also recognised for their own personal contributions over the last year by AltNewsMedia with well deserved awards. Stefan Molyneux spoke about Silicon Valley and the tactics of Tech companies to support the wishes of the globalist elites. Imam Tawhidi (Imam of Peace) spoke about his persecution by the far left for wanting to be a voice that condemns Islamic Extremism. Anne Marie Waters discussed how democracy itself was not upheld by the police when left wing mobs closed down a political hustings rather than clear the violent mob. James Delingpole amused us with his experiences of challenging mainstream narrative around climate change. Amy Mek shared her personal story of being pursued by the media working with others to do all in their power to attack her friends, family and husband, believing that by trying to ruin her life they will silence her voice. As a Jewish woman, she is called a Nazi in attacks that can only be described as evil. Her story shocked and moved all that heard it. Katie Hopkins gave us ‘5 lessons for life’ in a typically humorous way, whilst wearing a ‘yellow vest’. David Vance finally spoke of the toxic legacy Fake News Media. How everyone now that isn’t a far left socialist is laughably classed as ‘far right’ or ‘fascists’, by people who clearly do not understand the terms. All the voices are reasonable. Moderate. They talk sense and have opinions with which you may agree or disagree. But it is only by allowing these voices to speak freely now will we prevent actual extreme voices from rising in the future. After the event, BuzzFeed decided to attack the event, no interest in the content,what the speakers had to say. They could have asked. They could have attended. But no, as they wonder why they’re having to fire ‘journalists’ from their failing platform, they choose to merely try and discredit. The Muslim Council of Britain spokesman attacked the Imam of Peace due to having photos with people they do not like as they have criticised the ideology of Islam. Something perfectly legal in the Western World, just as any other ideology or religion can be criticised. Imam Tawhidi wishes to break bread and have dialogue, bring all sides together – yet the MCB demonise him and wish to create division. These are the very issues we have to tackle. The moderate voices must win through and the fascists, the censors and the bigots who attack before even listening to what was said cannot be allowed to close down reasonable dialogue. That is a future where everyone loses.